The following tips are designed to assist you in applying the latest research in tangible ways in your classroom, school, or district. In order to effectively analyze and utilize information, students should be able to navigate digital resources. Boolean operators assist students in finding relevant information efficiently when using online search engines and databases. Many students have difficulty assessing the reliability and credibility of digital sources, so it is important that teachers demonstrate how to evaluate sources when gathering information. The purpose of gathering information is to generate new conclusions. In the global community of the 21st century, learning to negotiate and resolve conflict is a key to effective communication and developing an understanding of others. Addressing complex problems requires students to shift between divergent and convergent thinking. Understanding the nature of assertiveness lays at the foundation for responsible communication. Though sometimes multitasking may be necessary, there are times when it can be detrimental to learning and even dangerous to ones' well-being. When sound reasoning is not used to form conclusions, errors occur due to faulty logic. When students create mental images, they do not create anything tangible, but these are more than just mental pictures. They can also include smell, taste, touch, sound, kinesthetic sensations, and even emotions. Conative skills refer to one's ability to analyze situations in light of what one knows and how one feels and select appropriate actions. Discussions that develop the awareness that perceptions are not necessarily reality are powerful foundations for understanding and controlling oneself (a conative skill). Optical illusions are a good way to stimulate discussion about perceptions. Self-efficacy is the disposition that an individual has control over his or her life. Developing this disposition is at the core of understanding and controlling oneself. Although most students interact with the Internet on a regular or even daily basis, research suggests that many do not know how to effectively find and evaluate online information for a specific purpose. Teachers can develop students’ ability to find information by illustrating how to use keywords to guide research. In order to generate keywords, students first decide what central topics or ideas they will investigate and then determine synonyms, examples, and related terms they can use to broaden their inquiry. Students can also add to their list of keywords as they research to further refine what they know about different aspects of a topic. For instance, students gathering information on the causes of the Civil War might develop multiple subcategories or keywords that relate to each cause they find (pp. 36–39). When students understand how to use keywords in tandem with common Boolean operators such as quotation marks, AND, OR, and NOT, they can better control the specificity and accuracy of their search results. Teachers can compare and contrast the information obtained with and without Boolean operators to demonstrate the effect of these operators on web and database searches. A visual comparison of the impact of different Boolean operators, such as a Venn diagram, can also help students decide when and how to use these techniques to enhance their online research (pp. 41–42). Teachers can help students assess the credibility and reliability of digital sources by directing them to examine a source’s author and purpose. For example, when students investigate the purpose of a source, they might consider whether a source intends to sell a product, entertain its readers, provide information, or advocate for certain ideas. Students can then describe how different purposes affect the presentation and reliability of a source. Teachers can also instruct students to use a source’s form or type to help determine its credibility and reliability. For instance, certain types of sources such as blogs and wikis are less credible and reliable because authors are rarely experts in their field and because such websites have little to no oversight. In contrast, website URLs with .gov and .edu domain names are generally more reliable because they are sponsored by official government or education organizations (pp. 38–39; 42–43). Twenty-first century students must be facile at gathering, organizing, and scrutinizing information, but they must also be skilled at generating valid conclusions based on that information. Generating conclusions is a natural human phenomenon. 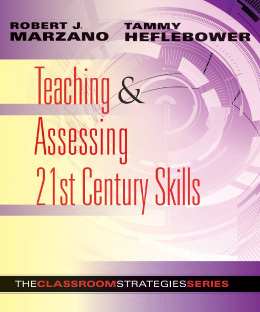 Teachers can and should teach students to analyze and revise their conclusions for the purpose of making them as powerful and useful as possible (p. 52). The goal of developing skills for understanding and interacting with others is to more effectively address controversies and conflicts. Controversy is when one person’s ideas, information, conclusions, theories, or opinions are incompatible with another person’s. Conflict exists when two people are trying to accomplish incompatible goals at the same time. A common tool to address conflict and controversy, negotiation is a process by which people with differing goals or interests try to work out a settlement (pp. 33, 168, 172). Both divergent and convergent thinking are needed when addressing complex problems and issues. Divergent thinking is thinking without limitations or constraints to generate a wide variety of original ideas. Once a wide variety of options are identified, students shift to more convergent ways of thinking. Convergent thinking involves considering real-world limitations or constraints to select the best course of action (pp. 79–80). In order for students to better interact with and understand others, they should become aware of the four major types of behavior commonly exhibited during interaction. These are: (1) passive behavior, (2) aggressive behavior, (3) passive-aggressive behavior, and (4) assertive behavior. Awareness of the reasons behind others' behaviors enables students to take responsibility for the outcomes of their interactions with others (pp. 160–161). One way to mitigate the potentially negative effects of multitasking is to list tasks and give each a priority level. This provides an opportunity for the student to learn time management, prioritization, and the value of organization (pp. 71, 73–74). Dr. Marzano has identified seven ways faulty logic can occur. These are: contradiction, accident, false cause, begging the question, evading the issue, arguing from ignorance, and composition and division. After students have an understanding of these types of errors, a teacher can ask them to find examples in the media (pp. 44–45). Creating mental images requires more mental energy and therefore leads to deeper processing than creating graphic representations, drawing or sketching. When students create mental images, they must hold them in their working memory while elaborating on them, questioning them, and drawing conclusion from them. The effort required to visualize and manipulate mental images creates a more permanent and more deeply processed record in the brain of the content being studied (pp. 109, 196). Three types of strategies that are useful in understanding and controlling oneself are: (1) becoming aware of the power of interpretations, (2) cultivating useful ways of thinking, and (3) avoiding negative ways of thinking (pp. 10, 121). Because optical illusions are usually morally neutral, they allow students to easily acknowledge the truth of a perception different from their own. This allows them to freely discuss both their own and others' perceptions, and it visually illustrates the idea that two people can hold different perspectives and both be right (or wrong) (pp. 121, 197). Helping students cultivate self-efficacy involves teaching them optimal ways of thinking, including resiliency. As the teacher presents examples of resiliency, whether from literature, a well-known person in their field, or a local personality, they can lead a discussion of its characteristics. Ultimately, students must examine their own resiliency (pp. 24, 133–134).